RUGBY UNION: Waratahs coach Daryl Gibson has warned his team to be extremely wary of the Southern Kings on Friday night given the South African team are among the clubs being targeted for the axe from Super Rugby next year. 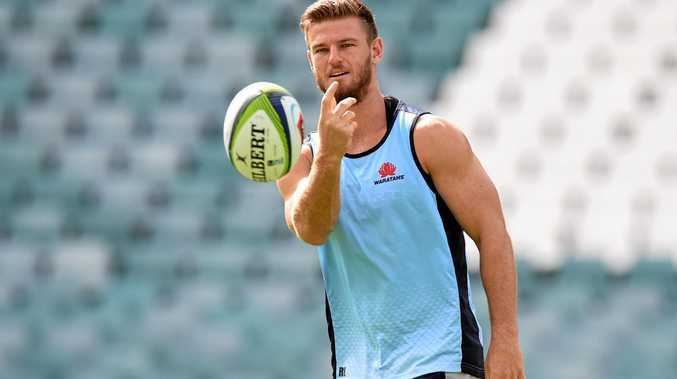 Gibson's appraisal came as he named his team to take on the Kings at Allianz Stadium, with Rob Horne returning and Dean Mumm being benched the main changes. Wallaby forward Mumm has been replaced by Dave McDuling at lock, and with Horne overcoming a hamstring injury to take his place at no. 13, Israel Folau shifts back to no. 15. Sekope Kepu's suspension means Tom Robertson will return from concussion and play tighthead prop, and Angus Ta'avao joins the bench after also returning from a long-term injury. Reserve back Andrew Kellaway has been ruled out for 4-6 weeks after suffering a hyoid fracture in his throat playing club rugby over the bye weekend, giving Harry Jones a call-up. The Kings have won just one game this year - and three in the past two years - and it's this lack of success that has the franchise firmly on the chopping block. SARU will decide which two teams of its six will be cut in June, and just as the Rebels and Force are rallying under the threat of their demise, Gibson says the Kings will be motivated by their fight for survival. "The Kings are a very, very competitive team and I know they'll be galvanised by the news that's swirling around them and the uncertainty they're facing," Gibson said. "It is very similar to the Rebels situation and I am sure they'll come out and fight and show a real dogged determination that they deserve to be in the competition. "If we were in that same situation, as a coach you'd be saying the same thing to your team." Though wins haven't been plentiful, the Kings have emerged as an attacking outfit this year and partuicxaulty on their current tour of Australia. They have scored 11 tries in two games and registered three five-pointers in the last 11 minutes last weekend to deny Queensland a bonus point. "It shows what they're capable of and as I said to the team this morning, you have to respect what they can do," Gibson said. "They have guys out on the wings who can really hurt you, with a lot of pace. "They have guys who are very good on the ball and they have a real determination to play an unstructured style of football. They like those loose situations. "They're a dangerous team. We certainly won't be taking them lightly." Gibson said the McDuling for Mumm swap was part-management, part-reward. "Dean has had a high workload, he's played seven games and probably played just about every minute," Gibson said. "And Dave has been impressive. He has come on and done well, so we have rewarded him and given Dean a spell."